The story of the development of the electronic calculator is as much about the companies which manufactured them as about the technology. For some companies, such as Rockwell and National Semiconductor, calculators were just a side line, and they exited the calculator market and continued with their other business when the profits from them disappeared. Other companies depended almost exclusively on calculators, and with the collapse in profits on standard calculators in the mid-1970s most went out of business. These included Anita in the UK, Bowmar in the USA, and Busicom and Teal in Japan. Companies which had produced mechanical calculators struggled to change over to electronics and usually ended up buying them from subcontractors and re-badging them. In the mid-1970s with the great fall in profits they often went out of business or were bought by other companies, such as happened to the Facit company. Marketing company which introduced a large range of, mainly, hand-held electronic calculators in the early 1970s. A major manufacturer of slide rules which moved into hand-held calculators in the early 1970s but floundered in the calculator price crash of the later 1970s. Bell Punch Company / Anita - UK. The Bell Punch Anita models of 1961 were the first electronic desktop calculators. A pioneer of hand-held electronic calculators, was one of the largest manufacturers in the world in the early 1970s. Major manufacturer of pinwheel and stepped-gear mechanical calculators. A major supplier of accountancy equipment and mechanical calculators, Burroughs produced a range of electronic desktop calculators in the late 1960s-early 1970s. Busicom / Nippon Calculating Machine Corp - Japan. A very innovative company that produced the first single-chip calculator, the first true pocket calculator, and was inolved in the development of the microprocessor. Produced a range of electronic desktop calculators from the mid 1960s, and hand-held calculators from the early 1970s, including some of the first hand-held models. Produced a range of electronic desktop calculators from the mid 1960s and very competitively priced hand-held calculators in the early 1970s. Is still a major producer of calculators. Commodore / cbm - Canada/U.S.A. Office equipment supplier with a small range of mechanical add-listers, it was a major manufacturer of hand-held calculators in the 1970s. Comptometer / Felt & Tarrant - U.S.A. Felt & Tarrant manufactured the Comptometer, the most successful key-driven mechanical calculator. Produced a range of high-specification scientific and financial calculators in the late 1960s/early 1970s. Ministry of Electronics, was responsible for the introduction and development of electronic calculators into Russia and the other members of the U.S.S.R.
Was one of the major manufacturers of mechanical calculators, and marketed early desktop and hand-held electronic calculators made by other companies. Felt & Tarrant - U.S.A.
A major manufacturer of high-specification mechanical calculators, it produced one of the first fully transistorised electronic desktop calculators in 1964, and followed with a range of models. A pioneering calculator integrated cicuit manufacturer that produced a range of calculators in the mid-1970s before selling the designs to the U.S.S.R. Produced scientific desktop electronic calculators from the late 1960s. Introduced the first hand-held scientific calculator, the first hand-held financial calculator, and the first hand-held programmable calculator. Is still a major producer of scientific and financial calculators. 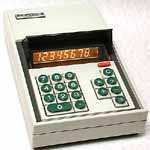 Manufactured a range of electronic desktop calculators in the late 1960s/early 1970s, often sold under other names. The company produced one of the first fully transistorised electronic desktop calculators in 1964, and followed with a range of models. A manufacturer of LED displays, Litronix moved into calculators and became a major supplier. Known for its stereo equipment, it marketed a wide range of electronic calculators in the early 1970s, including some of the first with LCD displays. A major manufacturer of high-specification mechanical calculators, it produced a few electronic desktop calculators in the early 1970s. A major manufacturer of high-specification mechanical calculators, it produced a few electronic desktop calculators in the late 1960s. A major semiconductor manufacturer which manufactured a range of highly successful hand-held calculators in the mid-1970s. Nippon Calculating Machine / NCM - Japan. Odhner - Russia and Sweden. Pioneer and major manufacturer of the pinwheel mechanical calculator up to the 1970s. Specialised in 10-key mechanical add-listers from the mid-1940s, produced one of the first programmable electronic desktop calculators, and a range of very stylish electronic calculators. Produced a range of highly competitive priced hand-held calculators in the early 1970s. Pioneer calculator chip manufacturer, introduced a range of highly successful hand-held calculators in the mid-1970s. Produced a wide range of hand-held calculators in the early 1970s. Highly innovative company, produced one of the first electronic desktop calculators in 1964, one of the first hand-held calculators, and some of the first calculators with LCD displays. Is still a major producer of calculators. Produced a range of highly innovative hand-held calculators in the 1970s. See Bell Punch Company / Anita. Produced a range of small, very distinctive hand-held calculators in the early 1970s. Teal - Japan and U.S.A. Produced a range of electronic calculators in the 1970s, including one of the first solar powered calculators. Semiconductor manufacturer that was a pioneer of the hand-held calculator in the late 1960s, and produced its own models from the early 1970s. Is still a major producer of calculators. Manufactured electronic desktop calculators from the late-1960s and hand-held calculators from the early 1970s to the mid-1970s. Produced low cost, high quality, mechanical add-listing machines. Had a bad experience with electronic calculators in the mid-1960s, but a range of these was eventually produced. Calculators are still marketed under the Victor name. Produced a series of powerful desk electronic calculators from the mid-1960s that employed logarithms which were generated electronically. Details of companies that manufactured calculator integrated circuits.